The highlight of the fall season is the celebration of Halloween. I never really knew what this holiday meant because I grew up in a country where there was a lot more emphasis on November 1st, called All Saints Day -- a time to honor loved ones who have passed away. 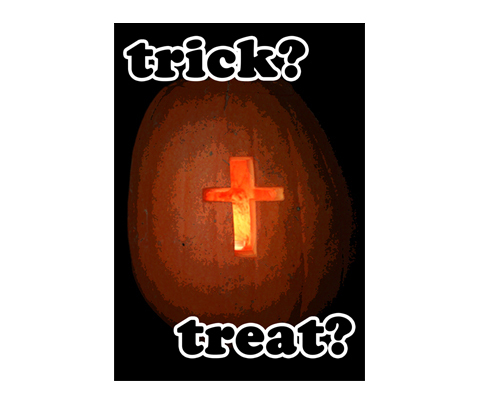 Today, living in a country where Halloween is the most profitable holiday of all time, I finally discovered the Celtic roots of this day and how it does not have any profound significance of the story of Jesus Christ. More than that, a lot of the activities associated with it are not exactly aligned what our faith stands for. The apostle Paul tells us: "But I say, that the things which the Gentiles sacrifice, they sacrifice to devils, and not to God: and I would not that ye should have fellowship with devils" (1 Corinthians 10:20). Now the question is, what are we going to do this weekend? We will not "celebrate" what Halloween stands for but we will definitely not ignore that it exists. We choose to see this as an opportunity to be "the light that will rise like dawn out of darkness (Isaiah 58:8)"
We will pick out pumpkins and make designs. I choose a Bible-based design like Noah's Ark. We will dress up and love on each child who knocks on our door and asks for candy. We will visit our church's alternative Harvest Party and see more cute kids in costumes! Are we going to allow our future children participate in trick-or-treat? The most truthful answer I have right now is "I don't know." But I am sure that I will go through the same process with my husband like we always do when making big decisions: pray, read the Bible, be still as we try to hear from God, and seek counsel. We will also see to it that our children will be lovingly educated about "principalities, powers, rulers of the darkness of this age and spiritual hosts of wickedness (Ephesians 6:12)." One of the best things about perpetually reading on the life of Jesus is how he remains kind, gracious, honest, and loving even in the most saddening situations. I cannot speak for Him, but my heart melts at the thought of Him walking alive today loving on every child even in the midst of an un-Godly holiday. I just want to be like Him! I really hope all of you have a beautiful Harvest/Halloween weekend, regardless of what you choose to do. Ultimately, this kind of dialog is between you and God. I encourage you to have that conversation with Him! I also hope that we all remain respectful of each other. I have, sadly, encountered a lot of self-righteous conduct in terms of this discussion. We can be theologically correct but if it is expressed as if we are more morally superior than others, it defeats the very purpose of being like Christ. I really pray that this is a weekend that we are deliberate in showing a victorious, redeemed, grace-filled life! We do the same...we dress up sometimes...I dress my 1 and a half year old up & we host a Fall party on the closest weekend day that's not Halloween (today, this year)...and we provide a positive, but festively fun place to dress up, eat some treats & spend time with friends. I think it's so important to keep our homes sacred and God-filled, espescially during this time of year...and when we go out into the world, to take all that into our hearts & share it in a loving, positive way. Will definitely keep that in mind when we start a family. Hope to see pictures of your Harvest party today!